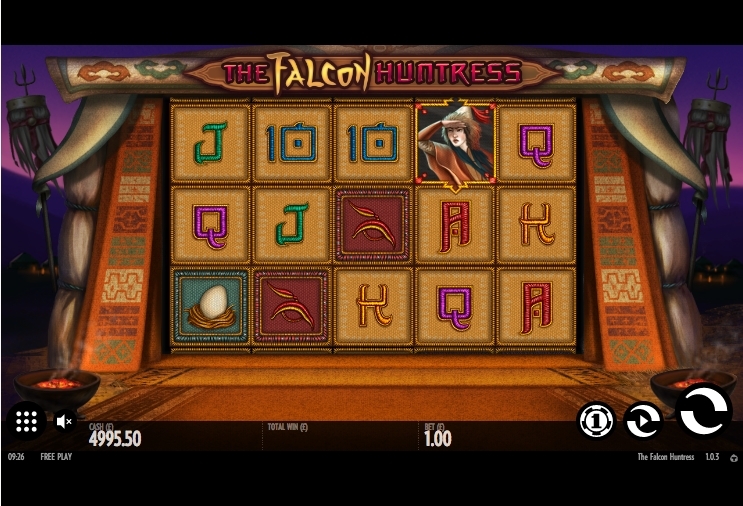 The Falcon Huntress is a rare Mongolian-themed slot from developer Thunderkick. There are countless Oriental-themed slots such as Konami’s China Mystery and Aristocrat’s 50 Dragons to name just a few, but this is genuinely original. The game has a mysterious ancient sound track, fitting of the theme. The games symbols in The Falcon Huntress appear as though they have been sewn onto the reels and are framed by a traditional yurt. So will this original slot leave our balance flying high or can we expect to have our wings clipped? On loading of The Falcon Huntress you will see that the game suggests a 10,050x win is possible. However, this would be a very rare event indeed. The game contains a total of 5 reels, 3 rows and 9 fixed paylines, hinting that it is probably quite a volatile slot. The Falcon Huntress is the top paying symbol, with 5-of-a-kind (5OAK) paying a handsome 500 coins. Pays drop down quickly or other picture symbols which pay between 50 - 100 coins for a 5OAK. A-K-Q-J-10 will pay between 10 - 15 coins for 5OAK wins. In The Falcon Huntress you will find the Wild is a very important symbol as it doubles up as the Scatter. 3 or more will trigger the free spins feature, which I will come onto shortly. The Falcon Wild can appear on any reel and will replace any other symbol on the reel to form a winning payline. Slots such as Novomatic’s Book of Ra Deluxe and Play’n Go’s Book of Dead will be well aware of the winning possibilities of expanding symbols. 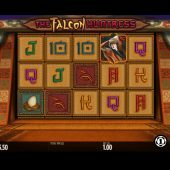 Well, in The Falcon Huntress you can get expanding symbols occurring at any time during the base game and the free spins feature. So if a winning payline has 2 or more matching symbols they can expand over all positions on the reel, creating many more winning paylines. This can happen at any time and suddenly makes the anticipation factor for big wins go through the roof with this game. Keep in Mind that the Wilds do not expand, but everything else can. Land 3 or more Wilds on the reels and you will be awarded 10 free spins and between 2 - 200x your stake before the feature has started. The free spins can trigger once during the feature and all expanding symbols can occur, just as they do in the base game.